The prompt for this week’s Nail Crazies Unite was watercolor. I decided I wanted to use actual watercolors since I have seen Robin Moses use them before. She has a great tutorial on youtube and so I decided to follow it. Her lines are, of course, much better than mine, but I half-assed keeping my acrylic paint wet enough and I just plain have less practice. I’m still pleased with my results. Robin Moses is a great nail artist to follow if you’re looking to up your game in nail art. She treats nail polish like what it is (paint) and just that little perspective jump can be a game changer. One thing I did that may help anyone else who tries this: if you’re like me and like to use a quick-drying top coat between your base polishes and whatever you’re putting on top you’ll find that the watercolor pools up. Just paint on a matte top coat after your quick-dry and the watercolor will stick to your nail better. Once you top coat the watercolors they will look much brighter. I wish I’d taken a before and after photo so you can see the difference. Maybe next time. 🙂 And finally, the watercolor Robin Moses and I are both using is from Michael’s. It is the Artist’s Loft Fundamentals Watercolor Pan Set (36 pieces). It has to be the one with 36 colors. There is a bigger set, but Robin’s commentors have said that they are less pigmented so stick to the 36. 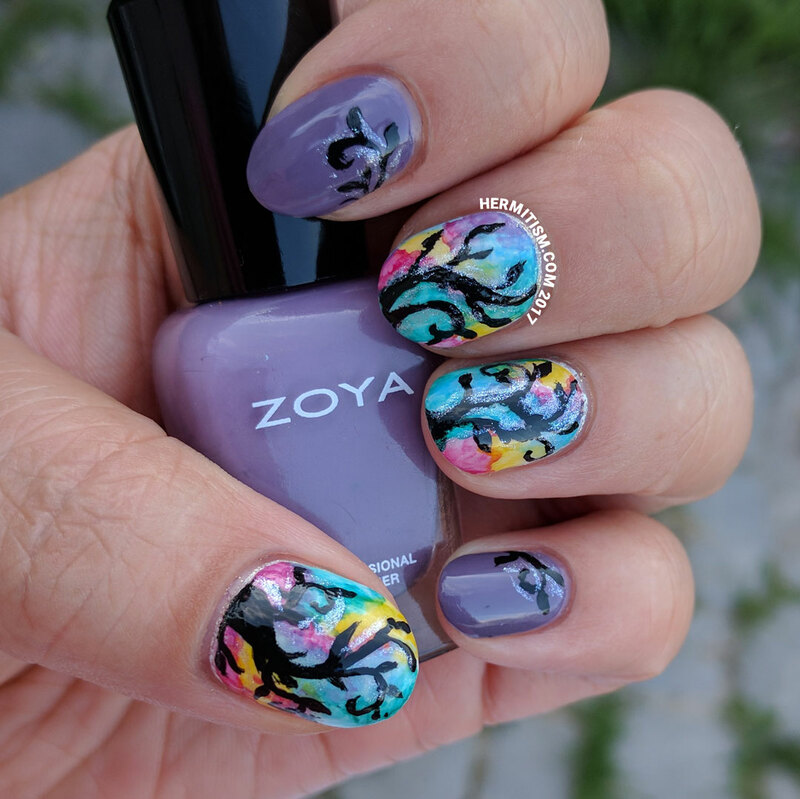 I also got to use one more of my mini Zoya polishes. 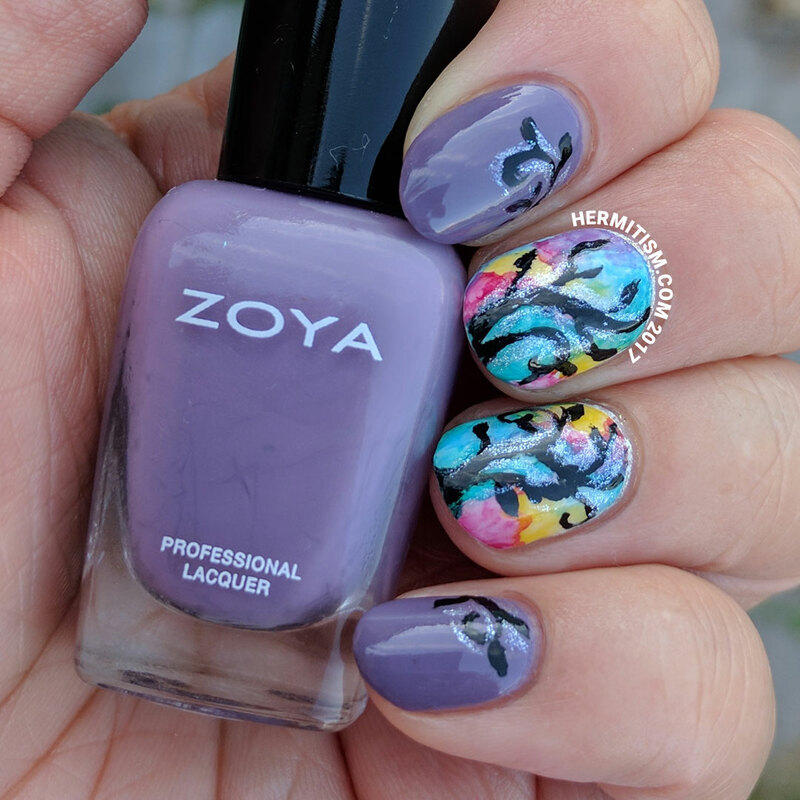 Just have Cece left and I’ve used all my new Zoya purchases–which is good since I bought 8 more polishes from their Earth Day sale. I’m not sure why I am pushing so hard to use each of the Zoya’s when I have several indie brand polishes that need love, but there you are. These turned out so gorgeous! 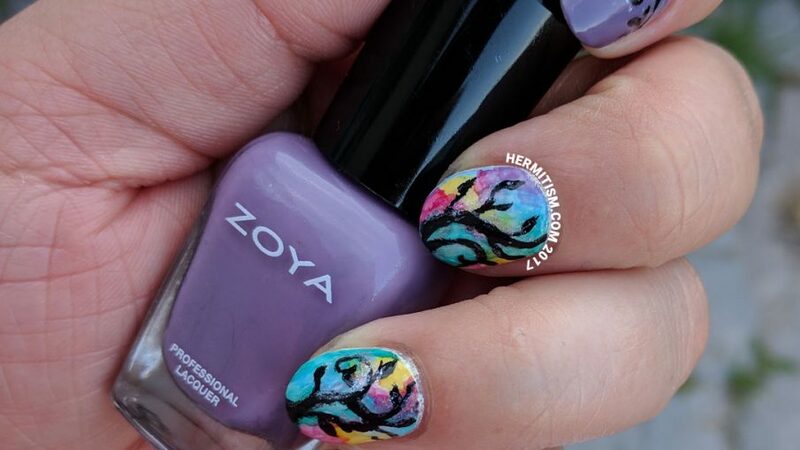 I tried to do a watercolor technique on my nails during the nail crazies unite prompt and totally failed, so that technique always impresses me when people pull it off. Thank you! I don’t think this would have worked at all well without the matte top coat. It really helped the paint to stick.